Four kids, a mini-van and a lot of love: 3 month baby pictures! Here are baby pictures, many of you have asked, and thou I can't believe how big my belly is at only 3 months...here they are. Ugh, I think it gets bigger earlier with every baby. 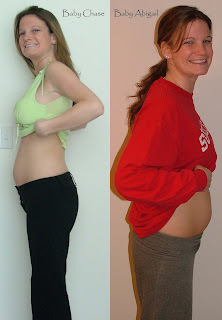 Here are pictures from when I was pregnant with Chase and Abby. Sorry if my skin color in the first picture blinds you...I hadn't seen the sun, it was winter! awww baby belly! its so cool to think that under that *little bulge* is a precious baby!!!! You look great girl. you are so cute in all the pics! You have the cutest little bump. I wish I was that tiny when pregnant. LOL. I love baby bumps. Your is so cute, if only I could look that good while pregnant. I think you look absolutely adorable. you look great. Each time! It's just not fair that you're that cute pregnant! I'm 8 months postpartum and I'm bigger than you, LOL! Really - you look wonderful!